They made a Hollywood film based on this book, right? Well, maybe it is still a good book. We'll see. 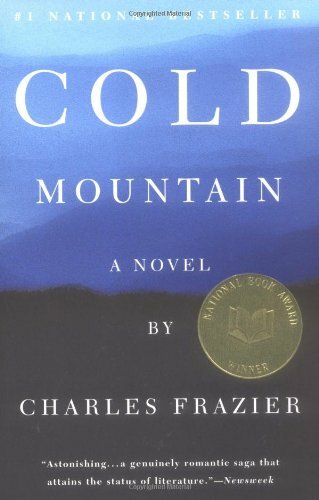 "A soldier wounded in the Civil War, Inman turns his back on the canage of the battle field and begins the treacherous journey home to Cold Mountain, and to Ada, the woman he loved before the war began. As Inman attempts to make his way across the mountains, through the devastated landscape of a soon-to-be-defeated South, Ada struggles to make a living from the land her once-wealthy father left when he died. Neither knows if the other is still alive." And, as occurred to me, neither one knows if the other one feels the same about them being together. There was hardly any time they spent to get to know eachother. Inman's struggle to get home appeared, therefore, to be driven by some illusion, which put the whole story into a strange light. Other than that, there was much to enjoy in this book: the dialogues, the desciptions of the daily work to get a farm going, and very much so the love for the countryside, the mountains and the animals. Especially by Ruby, who learnt to survive on her own and feels part of nature. Something is haunting me though - this book was made into a major motion picture. I know that all filming took place in Tchechoslovakya, since apparently there is no mountain as unspoiled by culture left in America. I find this very sad. The location is a farm where the weary traveller can spend some time. How appropriate, for this story. We rented a cottage there for the weekend. Surely there must be a bookshelf. On second thought, I took it home again with me. There was such a huge bookshelf there, that this one would run the risk of staying there forever undetected. Which would be a shame, for such a beautiful story. I will find another place for it. To be released at the meet-up, where we are celebrating Digimike's birthday. Ben erg blij met dit boek! Wil het al tijden graag lezen. Helaas ben ik al verschillende boeken aan het lezen, dus deze moet nog even wachten, maar ik kijk er naar uit!!! I am very pleased with this book. Unfortunately I am reading allready four books now so it has to wait .... but I am looking forward to reading it!